In my most recent book, Vocal Leadership, I quote directly from the journal of the greatest Roman orator of the last Century BC, Cicero, referencing public speaking and leadership. He identifies voice, pitch, and body language and what he shares is as relevant today as over 2000 years ago. I go on to discuss the power of voice as embodied by great leaders of the past, broadcasters, business innovators, spiritual teachers and others who have impacted the world. The point is, Voice has changed the world since the beginning of time. Cicero is known as one of the greatest teachers of public discourse in history. We have his wisdom, and even greater wisdom and research that has been developed over the past centuries, yet our schools do not teach it. I have had the pleasure of teaching at some of the top Universities in the world, including Yale, George Washington, NYU, and the USC School of Theatre. I have also had the honor of teaching at some of the world’s most successful businesses, including Deloitte, E&Y, Voya Financial, The Federal Reserve Bank, The NFL, NBA, MLB, Loews Hotels and the Ritz Carlton Hotel Company to name a few. In addition, I have taught broadcasters from virtually all the major news, sports, and television networks. None of them were aware of the principles taught in Vocal Awareness. It is incredible that our students, CEO’s, and even our professional television personalities have never studied the most advanced forms of communication available today. These are skills that everyone needs, yet even those whose livelihoods depend upon them are not aware of these fundamental communication principles. In our day and age, we are losing the art of public discourse. Since the advent of the internet, we are more comfortable typing our personal expression and basic communication than speaking it. At this writing we have the President of the United States Tweeting responses rather than speaking in public. We are hiding behind digital walls, not allowing our authentic selves to be seen and heard. What do your communication habits say about you as a leader? Ask yourself, do you even like the sound of your own voice? Are you comfortable communicating equally in all public situations and encounters? Do you have difficulty with eye contact or body language? Do you have trouble feeling confident when you speak personally or professionally? All of these aspects of communication can be learned. They can be mastered with the right techniques. In Communication Mastery, every detail matters, from the basics to the deepest levels of conscious and sub-conscious communication. Today I am offering a solution to our Universities, our Corporations, and to our Selves that will put us on track to truly impact the world with our voices. There has not been a body of work prepared to fully educate us on how to master communication in the modern age, until now. I am proud to introduce, A New Form of Mastery: The Vocal Awareness Leadership Academy. This is the culmination of over 50 years of work of Vocal Awareness and Communication Mastery at the highest levels of the arts, business, and broadcasting. It is the first time all of this knowledge has been available at this depth to the public without spending considerable time and money personally with me in one on one sessions. This is the curriculum that every student, businessman, broadcaster, CEO and individual needs to learn to communicate as their best Self. It is in short, the art of communication. This is essential to empowered leadership. Leadership excellence requires more than being just an effective speaker; it requires Communication Mastery. In all mastery, one learns to integrate Mind/Body/Spirit in everything you do. Communication Mastery is no different. There is a critical distinction between teaching students how to simply be business leaders and, as I teach them, how to “embody a leader” in business. “Embodying a leader” is not simply a turn of phrase. In my latest book, Vocal Leadership: 7 Minutes-a-Day to Communication Mastery (McGraw Hill Press), I describe the difference between training an effective speaker who merely conveys data/information, and teaching future leaders to become effective communicators/storytellers. In short, Voice is Power. It is not simply what we say but how we say it. How often in business meetings does someone walk in and merely put up a PowerPoint deck and begin streaming verbal data? In that regard, the business-school classroom is a microcosm of the business-world boardroom. We teach the material but don’t consider what I call “the message and the messenger.” The information may be there, but strategic communication is not. In the ancient Greek agora, or urban assembly place, leaders were chosen from among the great orators of the time; their unamplified voices were so powerful they could be heard and understood throughout the marketplace, commanding attention. In both Greek and Roman times, the finest schools taught rhetoric, or the art of public speaking. Diction and style, physical delivery and memorization were skills considered essential to a successful political career. Certainly leadership can be taught, communication can be taught –but it is not. While schools of business management are turning out future global leaders, business leaders, senior executives and/or managers, opportunities are being squandered by not communicating as effectively as possible. So, what does it mean to embody leadership? The first thing to consider is that speech is habit. We do not consciously or strategically think about breath, body language, eye contact, visceral language (communicating the emotion of words), vocal quality, pitch or timbre. Are we aware of what our leadership identity is — what in common parlance is called our brand? 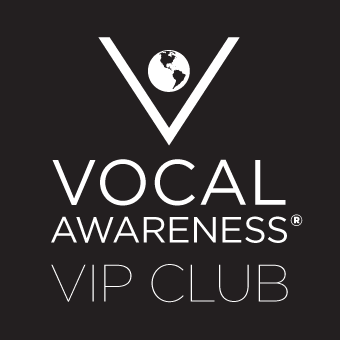 Vocal Awareness will teach you how to create your Persona statement, to identify and claim your idealized public persona. Do we prepare for every public encounter by practicing embedding the messages and goals we want to impart to our students? As speech is habit, we don’t think about these things, we just speak. But, if we are teaching leadership, we must embody leadership, not only in what we say but how we say it. We don’t learn, much less practice, the importance of vocal warm-up; the significance of tactical breathing and support; pitch, pace, eye contact; efforts to overcome personal anxiety; the use of essential elements of storytelling; and so on. But we should. Like our ancient Greek and Roman predecessors, our mission should be to speak with voices imbued with authenticity and authority — a goal achieved by disciplined, rigorous training and practice. It’s a common axiom that to teach and lead effectively, one must first lead by example. In this way, perhaps even subliminally, we inspire and ennoble our students as well as our business team to recognize the intrinsic value of mastering the art of communication on the path to leadership excellence. The Vocal Awareness Leadership Academy was developed to do just that. This course is the definitive work on how to communicate as a Leader in everything that you do. Pragmatically speaking, we are all on a personal/professional journey for many reasons: career, leadership, money, talent, fame, personal development… Vocal Awareness is the glue that sticks everything together. This is even more so in organizations. Leadership is precisely that which guides the efforts of many towards one great purpose. The method of that guidance is always a form of communication. How that communication is performed and what is actually communicated to others is not always what the business owners or group organizers had in mind. It takes a lot of work to be ourselves in public, and it requires practice and effort to truly communicate your message and purpose clearly to those around you. You will find, as have corporate leaders, athletic champions, entertainment stars and broadcast legends, that when you master these proprietary communication techniques, you master your ability to lead and inspire others with the integrity of your message and who you are. It does not matter what our reason is for studying this Work. For whatever you do, the core is about integration and integrity, the root source of both means wholeness. Whatever your motivation, the results are the same—the ability to embody the integrity of who you are in full Conscious Awareness everywhere at all times. This is Communication Mastery. This is the mark of a leader who makes a true impact on the world. Ultimately through the Vocal Awareness Mastery techniques in all communication whether prepared or spontaneous, one learns to communicate in Mastery as the leader you know yourself to be. Whether you are a brand new student looking for ways to enhance your professional presentation skills, a seasoned business leader wanting to learn leadership excellence and ‘not be merely a business leader but rather become a leader in business’, a marketer, a broadcaster, or someone searching for a new career, it is imperative that you understand that you never get a second chance to make a first impression. May this letter and the new Leadership course that follows invigorate you and help you learn how to live in Communication Mastery. Through your commitment to personal excellence and the skills learned through the Vocal Awareness Leadership Academy, you will be equipped with the tools that can truly enable you to fulfill your Vision/possibility and in turn, help Change the World Through Voice. P.S. A key theme in Vocal Awareness is Empowerment through Voice. As such, if you know a school, university, corporation, or leader who could improve their communication, send them this email and let them know about the Leadership Academy. If you are a Vocal Awareness student, please share this message with at least 5-10 people or organizations you know who would be helped by mastering these principles. And of course, buy and enjoy the course.